SARAJEVO, Bosnia-Herzegovina (CNS) — To overcome fear, discrimination and conflict, people must have a deep desire to open themselves up to God and his mercy, and work actively for peace every day, Pope Francis said. God’s plan for creation is peace, “which always meets opposition from humanity and the devil,” he said during a one-day visit to Bosnia-Herzegovina June 6. The cold reality today is that the world is facing “a kind of Third World War being fought in piecemeal” amidst “an atmosphere of war” worldwide, he said on the 71st anniversary of “D-Day,” the World War II anniversary of Allied forces landing in Normandy marking the liberation of Europe. 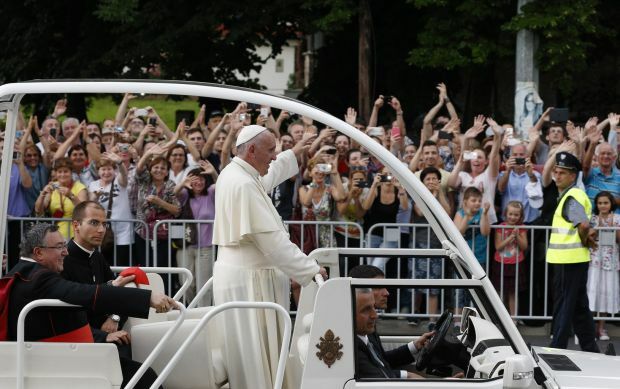 But the “ray of sunshine piercing the clouds” is Christ’s appeal to work for peace, the pope said during an outdoor Mass in the capital’s Kosevo sports stadium, where more than 60,000 people gathered from different parts of the Balkan region under a hot, hazy sky. Signs of peace emerging from a war-torn nation stood out throughout the city, whose residents are mostly Muslim. Small groups of well-wishers and cheering families lined the main avenues from the airport as armed military helicopters circled the sky. Sleek modern glass and steel commercial buildings were scattered among rows of towering communist-era apartment buildings whose gray cement walls were riddled with bullet holes and gouged by shrapnel. The holes left behind are marked with large dark grey splotches where the newer cement was troweled on and left unpainted. Flowers adorned some gravestones in a makeshift cemetery on a grassy plot between a snarl of highway bypasses. During the years of urban warfare, it was difficult to bury the dead in established cemeteries on the outskirts of town, so parks and roadsides became burial grounds. More than 100,000 people died and millions more were displaced during the 1992-1995 conflict, which saw a Serb campaign of ethnic cleansing of Bosnian Muslims after the mostly Muslim nation declared independence from Yugoslavia in 1992. “War means children, women and the elderly in refugee camps; it means forced displacement of peoples; it means destroyed homes, streets and factories; it means above all, countless shattered lives,” the pope said in his homily. Peacemaking requires putting justice into practice, and it takes patience, passion, experience and the tenacity to never give up, every day, “step by step,” he said. A vital step, one that cannot be skipped, he said, is personal conversion since nothing in the world can change without a change in the human heart — one that makes room for God, his love and mercy. Only with such change can a person see that former enemies “really have the same face as I have, the same heart, the same soul,” he said. Signs of unity were seen throughout the Mass. An ecumenical choir of 1,600 people from Catholic and Serbian Orthodox churches and the country’s national choir were accompanied by the nation’s military band. Behind the altar was an intricately detailed chair for the pope, hand carved from dark walnut wood by a Muslim father and son. A large cross placed near the altar still bore the punctures of ammunition from the three-year long conflict. In just the first hours of his visit, the pope said he saw signs of hope in the joy and smiles of the Muslim, Jewish, Orthodox and Catholic children who greeted him at the airport. “In order to successfully oppose the barbarity of those who would make of every difference the occasion and pretext for further unspeakable violence, we need to recognize the fundamental values of human communities,” values that help people communicate, forgive, build and grow, Pope Francis said. “This will allow different voices to unite in creating a melody of sublime nobility and beauty, instead of fanatical cries of hatred,” he said.